2 Bdrm Grnd flr Executive flat. Hall. Lounge. Dining kitch. 2 Bdrms. Bathrm (CT band - C). Parking. 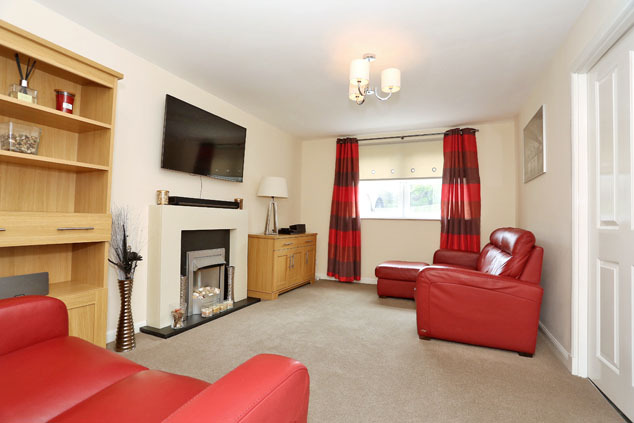 Fixed price £185,000 Entry by arr. Viewing contact solicitors. Below Home Report Valuation (EPC band - C). 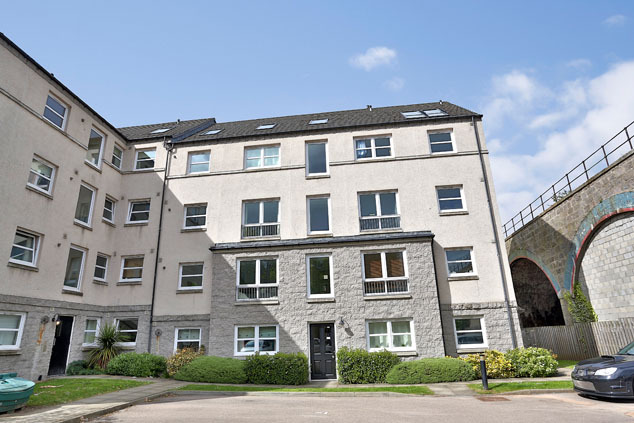 We offer for sale this spacious and immaculately presented two bedroomed executive apartment located within a modern development in the south Ferryhill area of Aberdeen. This apartment has one of the best positions within the development. The property has been maintained to an exceptionally high standard throughout with the accommodation comprising a good sized entrance hall, light and airy lounge, well appointed dining kitchen, two double bedrooms with fitted wardrobe facilities and a centrally set bathroom with shower over the bath. It has a quiet outlook to the front and rear situated within the well maintained communal landscaped gardens and benefits from an exclusive allocated parking space and has gas central heating and full double glazing throughout. Viewing of this desirable apartment is highly recommended. Devanha Mews is located close to the Duthie Park with its Winter Gardens and walks along the River Dee together with a good range of shops, restaurants sports and leisure facilities. 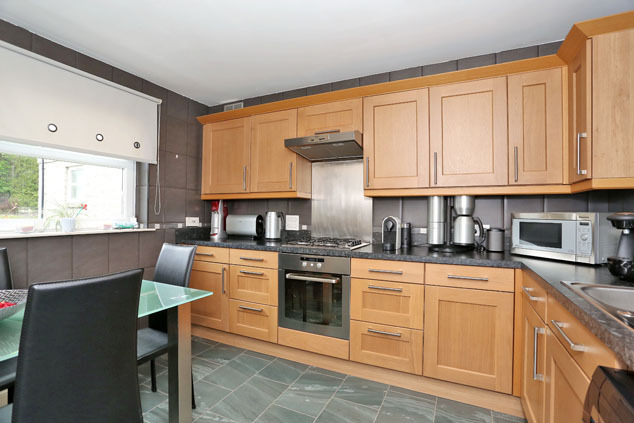 The development is within easy walking distance of the city centre as well as excellent rail and public transport links. Communal Entrance/Stairwell Attractive and well maintained mutual areas with security entry access and carpeted hallway/stairwell leading to all apartments. Entrance Hall Entered via a hardwood exterior door, fresh neutral décor, fitted cupboard houses the hot water cylinder and gas meter. Security entry handset. Smoke detector. Lounge 16’0” x 10’4” [4.90m x 3.15m] approx. Overlooking the central courtyard, this light and airy lounge offers ample space for a range of furnishings. A particular focal point is the modern fire surround housing an inset electric fire. TV and telephone points. Dimmer switch. Door to kitchen. Dining Kitchen 11’1” x 9’9” [3.40m x 3.00m] approx. Accessed via the lounge, this well appointed dining kitchen is fitted with a range of modern wall and base units incorporating roll front work surface and extensive splashback tiling. Stainless steel sink with mixer tap and drainer. The integrated four ring gas hob with stainless steel splashback and extractor hood will be included in the sale along with the integrated oven/grill and free standing washing machine. Space for a family dining table and chairs. Central heating controls. Karndean tile effect flooring. Bedroom 1 11’9” x 9’11” [3.60m x 3.05m] approx. 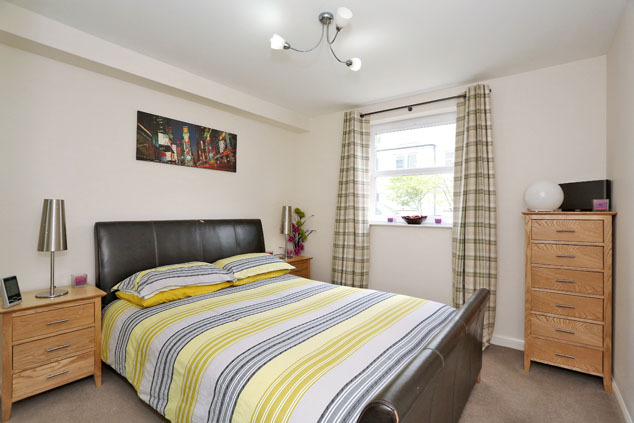 at widest This spacious double bedroom overlooks the well maintained shared gardens. A double fitted wardrobe provides shelf and hanging space. Bedroom 2 11’9” x 8’2” [3.60m x 2.50m] approx. 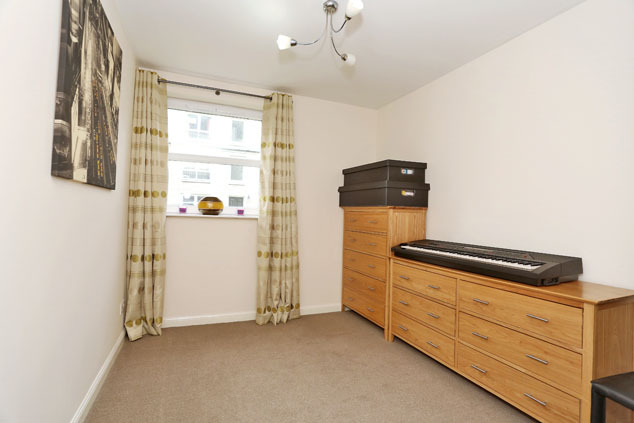 at widest A further double bedroom again with a double fitted wardrobe providing shelf and hanging facilities. 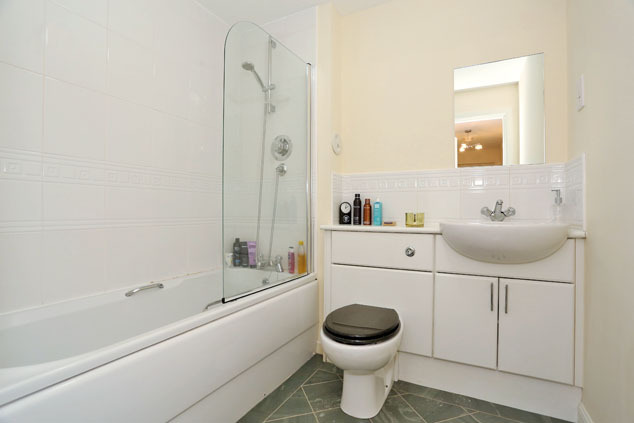 Bathroom Centrally set, the bathroom is fitted with a white three piece suite comprising w.c. with concealed cistern, wash hand basin set within a vanity unit with splashback tiling, bath with shower over and glazed screen alongside. Fully tiled around the bath and shower area. Karndean tile effect flooring. Xpelair. Shaver point. Outside Well maintained mutual gardens are laid mainly to lawn with trees and decorative borders. Allocated car parking space together with additional visitor parking facilities. Directions Travelling west along Union Street, turn left onto Crown Street. Proceed to the end of Crown Street and turn left at the traffic lights onto Millburn Street. At the next set of traffic lights, turn right onto South College Street and Devanha Mews is the development on the right hand side before the railway arches. On entering Devanha Mews, continue to the far end and 172 is the last block on the left hand side. Notes Gas central heating. Double Glazing. EPC=C. The property will be sold inclusive of all carpets, blinds and light fittings along with all integrated white goods. The date of entry is material and offers subject to survey, subject to finance or subject to the sale of the purchaser's own property will not be considered. The communal parts of the development are maintained under a contract and a monthly factoring fee includes the cleaning and maintaining of these areas and also includes a building insurance.